Patrick Kane in a scuffle? Richard Panik with a fight and a game misconduct. Marcus Kruger and Ryan Hartman both, with unsportsmanlike conduct penalties. It was that kind of night for the Chicago Blackhawks as their focus fell apart half way through the second period as the Florida Panthers took full advantage and coasted to a 7-0 victory. After trailing 1-0 in the first minute of the second period, half way through the period, Ryan Hartman was called for unsportsmanlike conduct when he didn't care for the hooking penalty he had just received. After the first penalty was killed, Marcus Kruger was called for interference setting up the damn to break for the 5-on-3 opportunity for Florida. Jonathan Huberdeau tallied on the power play. Less than two minutes after that, Jonathan Marchsssault scored his first of three, his first Hat Trick, natural at that, to extend the Panther lead to 3-0. This, an unfortunate, but familiar position the Blackhawks have found themselves in lately this week, was something discouraging, but not something they couldn't overcome. They had trailed two of their last three games by 2 and 3 goals heading into the final period, but still managed 3 of 4 points in those games. This, was not one of those nights. Florida continued their assault on the Hawks with four more goals in the period. Corey Crawford saved 21 of 25 shots before being relieved by Scott Darling, who saved 3 of 6 shots. 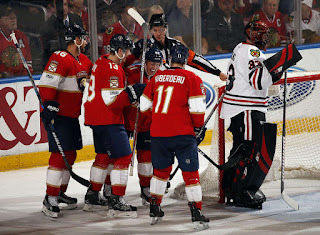 Florida golaie, James Reimer earned his first shutout as a Panther, stopping 25 shots. In his press conference, Coach Joel Quenneville said, "That was an ugly, ugly game...". Jonathan Toews pointed out, "If we continue to play like that and think we're going to turn it on come playoff time, we've got another thing coming." It's good to get your face bloodied a bit after winning 17 of 20 games, 11 of 12, on the road. It makes a team humble. Every team will soil the bed in a game here and there. Better now, than in the playoffs. The Blackhawks still hold an 8 point lead over the Minnesota Wild, who have now lost 10 of their last 13 games. The Blackhawks will travel to Tampa Bay to battle the Lightning on Monday. 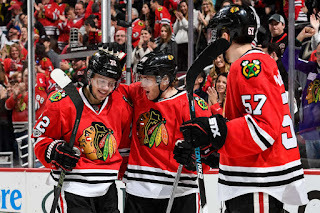 John Hayden scored his first career NHL goal and dished out 7 hits, while Ryan Hartman scored the game-winning OT goal with :20 left, his 16th, as the Chicago Blackhawks beat the Toronto Maple Leafs, 2-1. Hayden, 22, just finished his college career at Yale last week. He was the Captain of that squad and scored a goal a week ago today against Harvard. 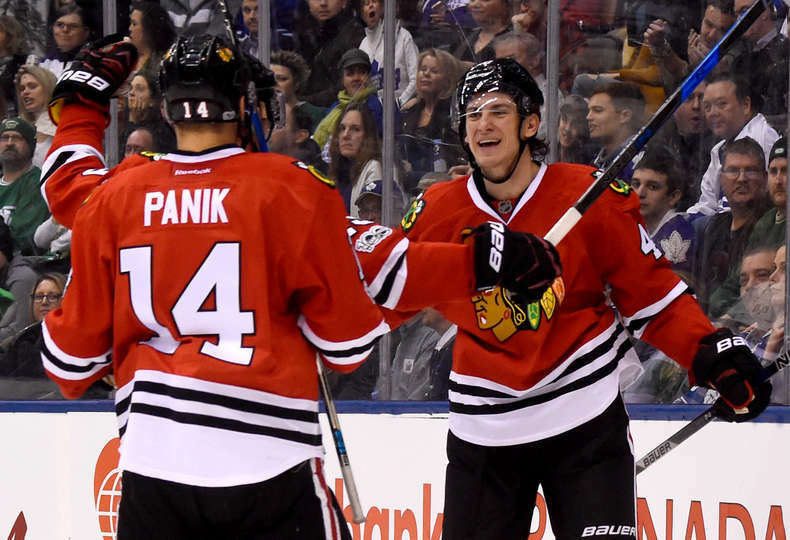 Now, he scored a goal in his 2nd NHL game and received an assist from his idol, Jonathan Toews. How things can change in a single week. Corey Crawford made 25 saves in the game and assisted on the game winning goal by Hartman. It was his first point of the year and his fifth for his career. 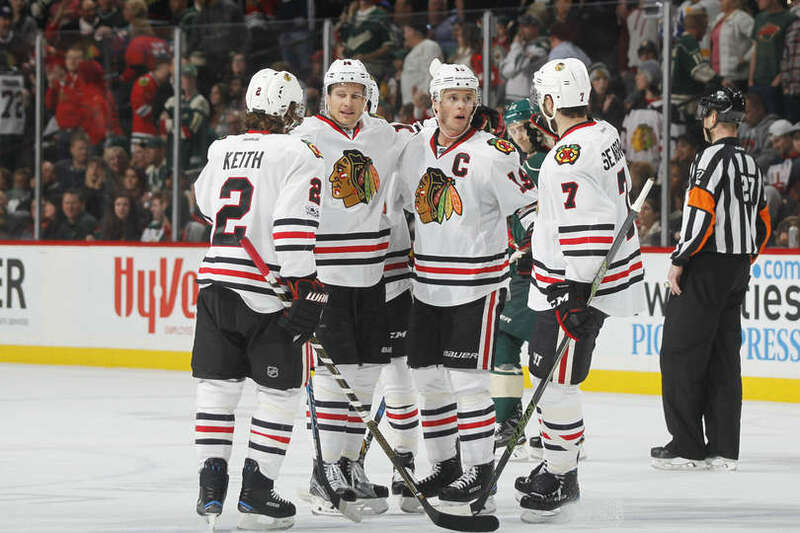 With the Blackhawks winning, and the Minnesota Wild losing at home against the New York Rangers, 3-2, the Blackhawks now hold a five point lead over the Wild for top honors in the Central Division and the Western Conference. The Wild still have one game in hand. Notable Mentions: Corey Crawford is within one game of winning 30 games in a season for the sixth time in his NHL career. He would have mostly likely had seven, if not for the shortened, 2012-13 season where he had 19 wins in 30 games. Hartman's game-winning goal was his 4th on the season. Duncan Keith played in his 904th career game, tying him with Dennis Hull for 7th on the All-Time Games Played list for the Blackhawks. 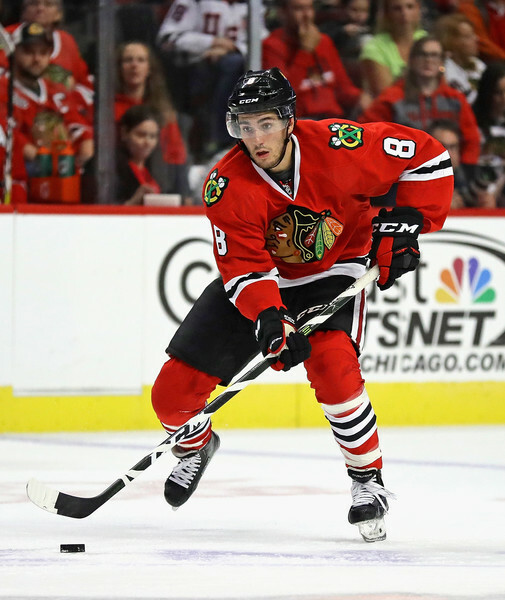 Nick Schmaltz entered this year, his rookie year, in hopes to be a contributor with the Chicago Blackhawks. Schmaltz was the Blackhawks 1st round pick (20th overall) in the 2014 NHL Entry Draft. He started the regular season with the big club for the first 26 games of the season. In that time, he mustered just 4 points (1G 3A). 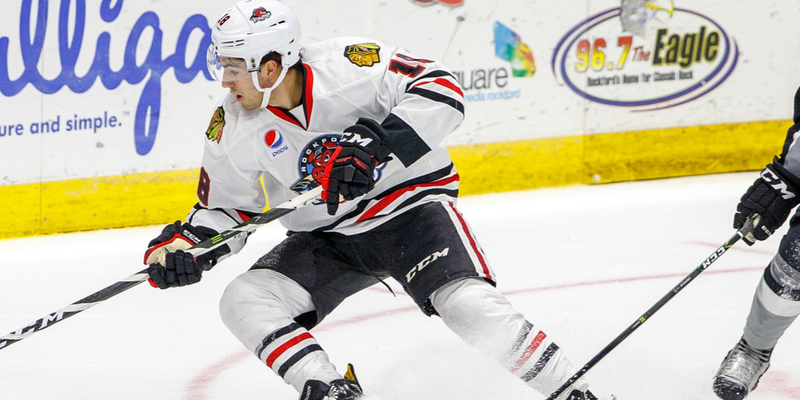 Feeling like more work was needed to his game, the Blackhawks sent Schmaltz down to their AHL affiliate, Rockford Icehogs in December. He spent just under a month there, where in 12 games, he contributed 9 points (6G 3A). Schmaltz made his way back up to the Blackhawks in early January, and within little time, found himself on a line with Jonathan Toews and Richard Panik. That line became the hottest line in the NHL for a period of time earning Toews, player of the month honors for the month of February. Since Schmaltz's return, the just turned 21 year old, in 23 games, has 16 points (5G 11A), and is a +7. 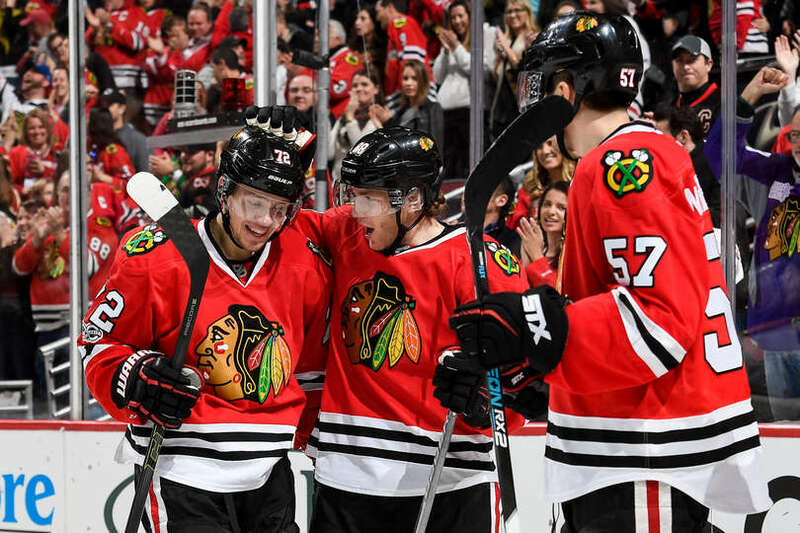 The chemistry that Toews had been looking for since the departure of Brandon Saad two years ago, looked to be finally found. 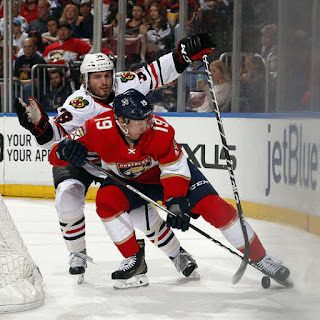 That is until Artem Anisimov went down in the first period of a game last Tuesday against the Montreal Canadiens. 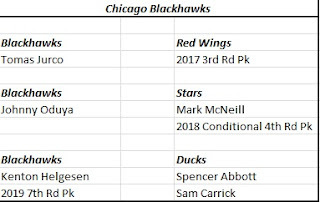 Schmaltz was dropped from Toews' line, and found himself centering a line between Patrick Kane and Artemi Panarin...oh darn. Schmaltz proved to have the primary assist on the game-winning goal that came from Panarin in the 4-2 victory. Schmaltz is a +2 with an assist in the two games thus far centering his new line. He will now have the opportunity to do so for the next 3-4 weeks as Anisimov will be shelved with a lower body injury. The Blackhawks have earned 30 out of a possible 36 points in their last 18 games as they visit the Toronto Maple Leafs tonight. There is pressure, put on by the team themselves, to take the top honors in the Western Conference and their division, as they currently hold a 3 point advantage over the Minnesota Wild. 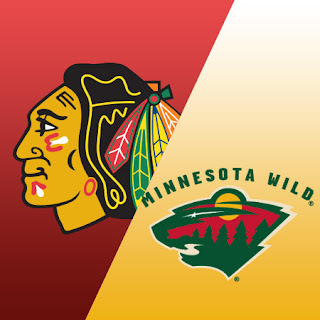 On January 31st, the Blackhawks trailed the Wild by 6 points while Minnesota had 3 games in hand on the Blackhawks. Schmaltz has some heavy weight on his shoulders, but he has a couple of wing men that can help him greatly. For Schmaltz, he probably didn't think this type of opportunity would be presented to himself at the beginning of the year, but now he is in the limelight to shine. 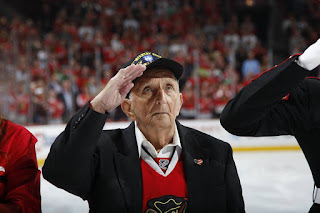 He seems up for the challenge as are the Blackhawks as they enter the last three weeks of the regular season. The Minnesota Wild currently hold a 3 point lead over the Chicago Blackhawks for the lead in the Central Division and the Western Conference. Sunday, they get together for what will feel like a 10:30am start, thanks to the television scheduling and daylight savings time switch where we lose an hour. Why not add a little flavor to this game that already has a lot riding on it, right? After winning seven straight games leading into a mini-bye (4 days off), the Blackhawks have lost their last two games. The Wild, are 4-3 after having their bye week, and are in the middle of a 5-game road trip as they enter the United Center on Sunday. The Blackhawks, playing their third game in four nights, are in a stretch of having 15 games remaining in 28 days to close out the regular season. The Wild are no better having 16 games left. The bye week may have helped these teams, but it is going to be a long road to the end of the season, let alone a rigorous two month playoff run for these two teams. Both teams come in to this game healthy with their key players. If the Blackhawks fall to the Wild on Sunday, they dig their hole further in hopes of catching the Wild for the top seed in the West by risking being 5 points behind them while the Wild hold a game in hand over them. The goalie matchups should see Corey Crawford up against Devan Dubnyk. Both are in a bit of a rut, Crawford has lost his last 2 games, while Dubnyk has lost 3 of his last 5 games. Zach Parise - 4 points (3G 1A) in his last 5 games. Artemi Panarin - 4 points (2G 2A) in his last 5 games. Jared Spurgeon - 0 points, -1, in his last 5 games. Nino Niederreiter - 1 assist, -1, in his last 5 games. Ryan Hartman - 0 zero points in his last 5 games. 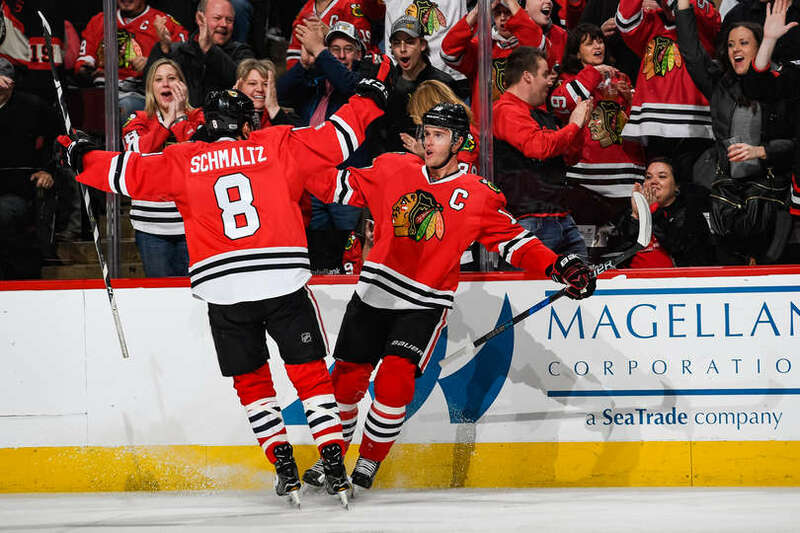 Before their bye week in mid-February, the Chicago Blackhawks had a 6-game road trip to finish first. Entering the trip, the Blackhawks decided to go gangbusters and play that set of games as if they were the last of the playoffs. They won five of those six games. Three of those games came against teams they have had trouble with. The Minnesota Wild, whom they lost their previous eight games against. Another was the Winnipeg Jets, whom they had lost all four games played against them this year. The last was against the Edmonton Oilers. In November, the Oilers beat the Blackhawks 5-1 in Edmonton. The bye week has been of speculation as it was introduced for the first time this year. It was meant to provide a break for the players in the middle of a grueling 82-game season. As of March 1st, records of teams coming off their bye weeks are 9-15-4. The Blackhawks lost their first game back, a 3-1 defeat at home against the Oilers. Since then? The Blackhawks have won their last seven games. Some of those games without the services of key players out for various reasons including Corey Crawford, Artem Anisimov, and Niklas Hjalmarsson. Now, a second, mini-bye presents itself for the Hawks. They have the next four days off before the final crunch towards the end of the season. They will end the season with seventeen games in thirty-one days. The first bye week seemed to do well although they lost that first game back. They have now won twelve of their last thirteen games. With four days off and some players banged up, (Scott Darling will be out for the next three weeks), the Hawks look to take advantage of even more time off. With their victory last night in Nashville against the Predators, they currently hold a one point advantage over the Wild. 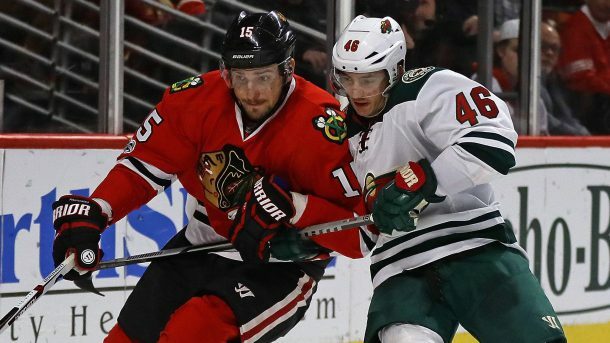 It most likely will be a short-lived lead, as the Wild have three games in hand on the Hawks. But, the Wild had three games in hand on January 31st as well, but held a six point lead over the Hawks. 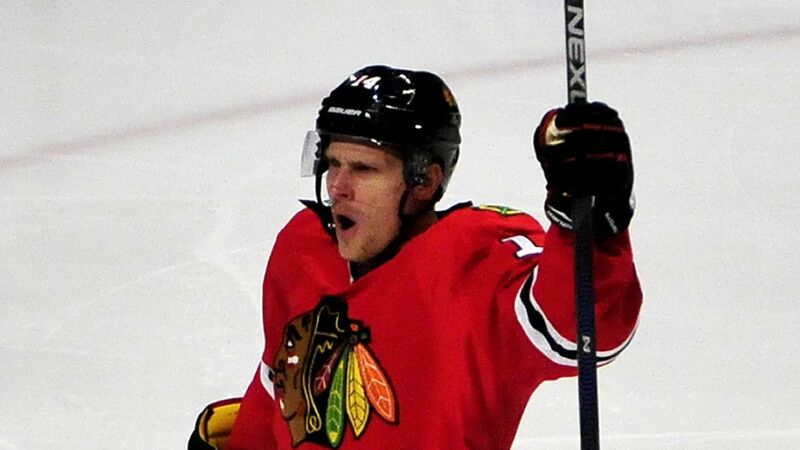 Within their last 14 games, Patrick Kane has 21 points (14G 7A), and Jonathan Toews has 20 points (8G 12A). Oh, and newly re-acquainted Johnny Oduya should be in the lineup when they return from their break. 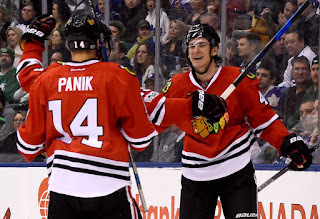 The Chicago Blackhawks couldn't be happier with the play of Richard Panik and how he has developed since being acquired last January in a trade with the Toronto Maple Leafs for Jeremy Morin. It was a trade that was considered minor since neither Panik nor Morin had made any real contributions to their teams. Coincidentally, Morin's trade to Toronto was the second time that Chicago had traded him. Panik, 26, was acquired in hopes to make some contributions, whether it be on the 3rd or 4th line. He had experience with his prior teams (Tampa Bay and Toronto), 141 games, but just 39 points. 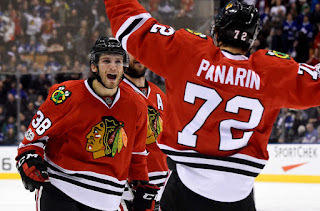 He played 30 games with the Blackhawks last year gathering 8 points (6G 2A). In the seven game series loss to the St. Louis Blues in the first round of the playoffs last year, he was one of the better players for the Blackhawks, finding himself skating on the top line at times with Jonathan Toews. Entering this year, he was expected to produce on the top line with Toews, and whichever other winger that happened to make up the last third of that line. Panik did not disappoint as he started the year red hot by scoring 6 goals on his first 9 shots of the season. He went into a slump afterwards where in his next 24 games, he accumulated just 5 points (2G 3A). Bouncing between lines to get his confidence back, nothing seemed to work until rookie Nick Schmaltz, 21, was put on the top line aside Toews and Panik. Schmaltz had spent the month of December with the Rockford Icehogs, the Blackhawks AHL affiliate, to work on his game, where he played 12 games and tallied 9 points (6G 3A). Since then, that line has become the top line for the Blackhawks, surpassing the Artemi Panarin-Artem Anisimov-Patrick Kane line. Richard Panik, in his last 9 games, has 12 points (6G 6A) and is a +11. One of those games, was a +5 performance against the stingy, defensive-minded, Minnesota Wild. He scored a highlight reel goal last night against the Pittsburgh Penguins. Panik is in a contract year where he will become a restricted free agent at season's end. As it seems every year, the Blackhawks are going to be strapped for any monies to be handed out with the salary cap restricting them again. Earlier in the year, the Blackhawks had agreed on a 2-year, $12million deal for Calder Trophy Winner, Artemi Panarin. 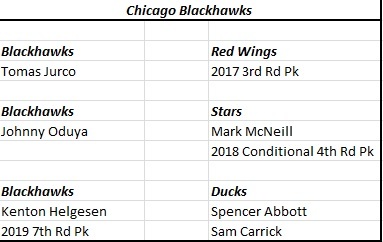 Joining Panik in free agency, are 8 others on the Blackhawks squad, including Scott Darling, Brian Campbell, Andrew Desjardins, and newly acquired Johnny Oduya, who will be unrestricted free agents. The other restricted free agents joining Panik will be Dennis Rasmussen, Tomas Jurco, Tanner Kero, and Michal Kempny. With nine players entering free agency, and a projected cap space of $6.6million, provided by capfriendly.com, Stan Bowman will have yet another off-season to try and work some magic in order to keep some of this talent pool and provide a deep team that manages to somehow stay competitive year after year. Until then, Panik and the Blackhawks will focus on the current business at hand, trying to win their fourth Stanley Cup in just eight years. How Does Central Division Stack Up After Trade Deadline? 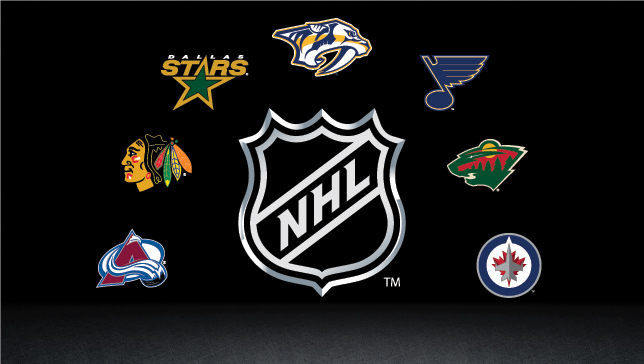 The NHL trade deadline came and went today at 3PM ET. and there were some big moves made by almost every team in the Central Division. 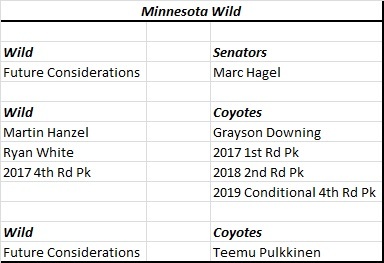 Not surprisingly, the Minnesota Wild and the Chicago Blackhawks enhanced their teams the most with key trades at the deadline compared to the rest of the division. The Wild acquired Martin Hanzel as the Blackhawks brought back Johnny Oduya. 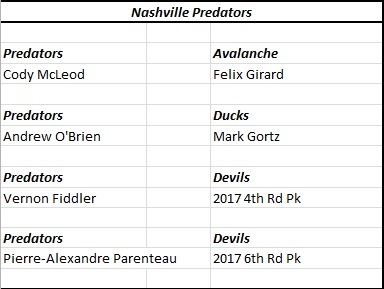 The Nashville Predators acquired Vernon Fiddler, while the St. Louis Blues traded away Kevin Shattenkirk. The Winnipeg Jets were very quiet with only one move, Drew Stafford to the Boston Bruins. 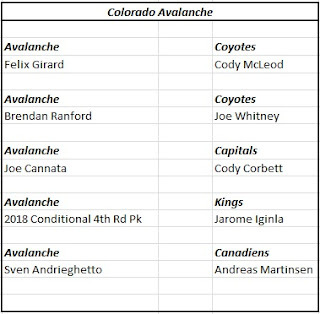 The Dallas Stars and Colorado Avalanche were busy supplying the rest of the NHL (seven teams) with ten players. Among them, the aforementioned, Oduya, along with Jordie Benn, and Jarome Iginla. The Predators will most likely finish third in the division and will most likely fall to the hands of either the Blackhawks or Wild. The Blues are desperately clinging to the last playoff spot as a wild card currently, but without Shattenkirk, they don't seem to be a plausible threat. Which means the Wild and the Blackhawks, the top two teams in the Western Conference, look to possibly find themselves in a situation to meet in a second round showdown. 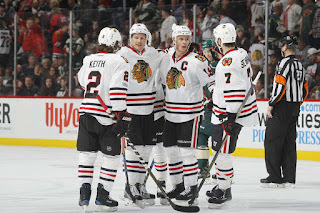 The Blackhawks have beaten the Wild in their last three playoff appearances, 2013-2015. The Wild are a different team now, with a different head coach. Will that be enough if these two teams meet? We won't know till we get there, but it will be damn exciting to watch. One of these teams can easily represent the Conference in the Stanley Cup Finals. The Wild, who have never made it there, or the Blackhawks who look for their fourth Cup in eight years. 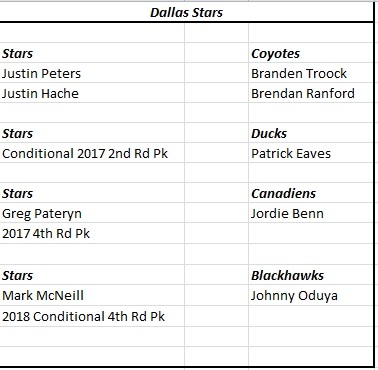 Below are the full trades made by all Central Division teams.